The published result of The United Nations fact-finding mission examining Israel's Operation Cast Lead against Hamas in Gaza in December 2008-January 2009. Headed by South African Judge Richard Goldstone, the mission's 575-page report found that "Israel committed actions amounting to war crimes, possibly crimes against humanity." This result comes as no surprise to the State of Israel, that declined to participate, knowing from bitter past experience that a report condemning Israel was a foregone conclusion. "This draft resolution saddens me as it includes only allegations against Israel . . . There is not a single phrase condemning Hamas as we have done in the report. I hope that the council can modify the text." Even though the report was bad enough already, as detailed below, only the part condemning Israel was used. "If this was a court of law, there would have been nothing proven. I wouldn't consider it in any way embarrassing if many of the allegations turn out to be disproved." The UNHRC has consistently discriminated against Israel. The mandate was not supported by many leading democratic members of the HRC – the European Union, Japan, Canada and Switzerland all refused to back the resolution. The mandate (HRC Resolution S-9/1) for the fact-finding mission was "to investigate all violations of international human rights law and international humanitarian law by the occupying Power, Israel, against the Palestinian people throughout the Occupied Palestinian Territory, particularly in the occupied Gaza Strip, due to the current aggression"
Additionally, the Resolution determined that Israel caused " massive violations of the human rights of the Palestinian people and systematic destruction of Palestinian infrastructure" while demanding that Israel "stop the targeting of civilians and medical facilities and staff and the systematic destruction of the cultural heritage of the Palestinian people, in addition to the destruction of public and private properties." One of the four members of the Goldstone Mission, Professor Christine Chinkin, had already made up her mind, having signed a Sunday Times article published on January 11 th( before the conflict had even ended) clearly stating that Israel's actions in Gaza amounted to "war crimes" and that Palestinian rocket attacks were not significant enough for Israel to exercise her right to self-defense. The other three members, Richard Goldstone, Hina Jilani and Desmond Travers all signed a letter, initiated by Amnesty International, stating "Events in Gaza have shocked us to the core." Thus all four members had expressed their conclusions before any investigation took place. Judge Goldstone has a long association with Human Rights Watch, even serving on its board until removing himself when it was pointed out that remaining with HRW would be inappropriate. Yet he cites HRW sources in the Report, including material by the Nazi memorabilia collecting Marc Garlasco, who was, at the time of writing, suspended by HRW pending an investigation. The fact that Judge Goldstone is a Jew further complicates the issue. Does this, as many haters of Israel are eager to believe add weight to the guilt of Israel or is he a self loathing Jew? Richard Landes considers this on his web site about Goldstone. www.goldstonereport.org His analysis includes the following observations. The particularly Jewish cultural trait of self-criticism has played a major role in the perception and understanding of the entire Goldstone controversy; Goldstone's Judaism, and his longstanding connections to Israel have been used by his supporters to validate the report, while some critics accuse him of betraying his people. Indeed, Goldstone defends himself by invoking the principle that such self-criticism is particularly incumbent on Jews given their values and history. Part of the problem concerns the public nature of the debate. While Jews and Israelis like to engage in public self-criticism (even self-flagellation), Arab culture abhors public self-criticism. Indeed part of Hamas' behavior in the conflict reflects a strong tendency to violently suppress internal dissent, as well as to demonize and scapegoat the enemy. Most people and nations avoid self-criticism whenever possible, so when Israel admits to wrong-doing, most people think it must be guilty of much more. According to Judge Goldstone the mission, "is not a judicial enquiry [but is] a fact finding mission." However, the Mission's report makes numerous factual findings and some legal findings just as if it were a judicial body. Whilst the Goldstone report was not bound by the rules for a judicial enquiry, it is being used as if it were by the enemies of Israel. Consider how long it took Goldstone to produce the report - There simply was not enough time for the job to have been done properly. That would have required a substantial period of intensive examination. According to the Mission's Report, the Mission convened for a total of 12 days. They say that they considered a huge volume of written and visual material running into thousands of pages; they conducted three field trips; there were only four days of public hearings; and yet in a relatively short space of time the members of the Mission agreed to about 500 pages of detailed material and findings with not one dissenting opinion throughout. They made no less than 69 findings, mostly of fact, but some of law and within those 69 there were often numerous sub-findings. All of this was makes it clear that the mission only had time to cut and paste the material that fitted their prejudiced understanding and the mandate to gather evidence against Israel. The report relied upon the contributions of Palestinian "eyewitnesses" and non-governmental organizations that have been proven to be unreliable, giving unverifiable evidence. The Mission did not try to cross examine or challenge the witnesses in any real way. Hamas forced UN investigators to do the interviews in the presence of its security men, meaning these witnesses were unable to report on the war crimes committed by Hamas for fear of retribution. Some of the Palestinian witnesses heard by the mission were actually Hamas operatives directly involved in terrorism. One such witness, Mohammed Fuoad Abu Askar of Jebaliyeh, was actually a senior Hamas operative who used his house to store arms and ammunition, which lead to the IDF strike against the structure. The Goldstone committee "found Khalid and Kawthar Abd Rabbo to be credible and reliable witnesses [and] has no reason to doubt the veracity of the main elements of their testimony." 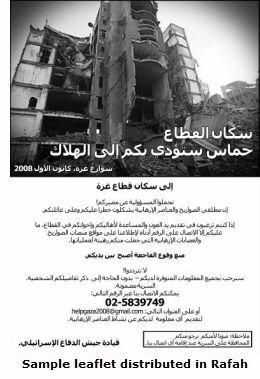 But Khaled Abd Rabbo and his relatives have given more than a dozen different versions of what happened to them on Jan. 7, 2009. Goldstone failed to take into account the loyalties of different Palestinian factions and the incentive for Fatah or Hamas members to blame Israeli soldiers for killings that were actually part of intra-Palestinian violence. Goldstone maintains that he could not find any evidence of the use of human shields by Hamas, even the terrorist organization admits it. He could have found videos on You Tube showing a terrorist picking up a child for use as a human shield and another in which Hamas leader boasts of the willingness of their population to be used as human shields. The report has created an unjust equivalence of a democratic state with a terror organization. In fact, Israel respects human rights and has a sophisticated legal and judicial system. Hamas does not. Goldstone refers to Hamas and other Palestinian terrorists as "armed groups" rather than the Gaza government’s operatives attacking Israeli civilians, while the IDF is accused of targeting Gaza's civilian population. Goldstone calls for both Israelis and Palestinians to investigate alleged crimes, without acknowledging that Israel's legal and judicial apparatus is fully equipped and motivated to address alleged violations of national or international law by its commanders and soldiers, while Hamas or the Palestinian Authority can not possibly be said to operates a legal system that comes close to anything resembling that of a western democracy. Then, as stated above, when the report came to the UNHRC, the criticism of Hammas that had been in the report was missing! Honest Reporting, who had many links to other reports. "During Operation Cast Lead, the Israeli Defence Forces did more to safeguard the rights of civilians in a combat zone than any other army in the history of warfare." Read a fuller account of Colonel Kemp's analysis. Talking about losses in the war, Hammad (of Hamas) confirmed significant personnel losses in Hamas' military wings for the first time. He said, "On the first day of the war, Israel targeted police stations and 250 martyrs who were part of Hamas and the various factions fell." He added that, "about 200 to 300 were killed from the Qassam Brigades, as well as 150 security personnel." Bottom line: 250 Hamasniks died on the first day, followed by 200-300 from the Qassam Brigades, plus an additional 150 security personnel, for a total of 600-700. That is in line with the IDF's numbers all along. Goldstone went along with the Hamas assertion, at the time, that these were civilian deaths. That was the message the world picked up and it is unlikely that it will be corrected by this late admission. Will that undo the harm it did? How far is he willing to go to try and rectify the damage? Will the media take any notice? Goldstone: "If I Had Known Then What I Know Now…"
Judge Richard Goldstone, head of the infamous UN panel that issued the Goldstone Report in 2009, backtracked on his most serious accusations on Friday. The Goldstone Report had accused Israel and Hamas of “actions amounting to war crimes, possibly crimes against humanity” during the 2008 Gaza War. Goldstone’s about-face includes a reversal on the contentious claim that Israel intentionally targeted Palestinian civilians. To have formally subjected itself to examination by his committee and the institutionally biased UN Human Rights Council that had formed it – a bias which Goldstone now acknowledges in his article – would merely have given his work greater purported credibility. Notwithstanding that absent formal cooperation, however, the truth about what happened in Gaza in December 2008 and January 2009 – the truth that Goldstone now disingenuously claims to have discovered only after he filed his malicious indictment of the IDF and of Israel – was readily available to him at the time. Israel did informally make the necessary information available to his committee in the shape of detailed reports on what had unfolded. And open sources, honestly evaluated, left no doubt that Hamas was the provocateur, that Hamas was deliberately placing Palestinians in harm’s way, that Hamas was lying about the proportion of combatants among the Gaza dead. Indeed, Honestreporting first reported on the fallacies and false accusations in the Goldstone Report back in September of 2009 using information that was available to the public. HonestReporting also provided a long list of resources for countering the report, all of which drew on public sources. Along with accusations of war crimes, Goldstone’s op-ed also puts an end to the dispute over casualty figures. While the Goldstone Report cited civilian casualty numbers obtained from Hamas, which were considerably higher than the IDF’s figures, Goldstone now admits that “the Israeli military’s numbers have turned out to be similar to those recently furnished by Hamas (emphasis added), adding however, that Hamas may now be exaggerating the number of terrorists killed by the IDF. Put simply, the IDF’s figures were correct all along. But it remains to be seen if the media recognizes that the commonly quoted numbers of “1,400 dead, including mostly civilians” – cited by the Goldstone Report – are inaccurate. The caption for the following image, taken from BBC’s coverage of Goldstone’s revelations, shows that the Beeb has yet to assimilate the new information. In an exclusive comment to HonestReporting, Hillel Neuer, the executive director of UN Watch, called on the UN to take decisive action in light of Goldstone’s revelations. 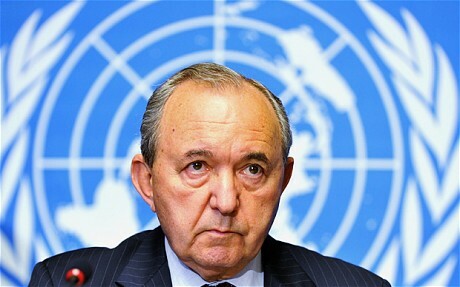 Now that the core finding of the Goldstone Report has been discredited by its author, the norms of international law, ethics, and morality require Judge Goldstone to urgently request the UN Human Rights Council to convene a special session to officially repudiate the report and halt its ongoing proceedings to implement it. An op-ed is not enough. Goldstone must officially inform all other bodies which received his false report: the UN Security Council, the UN General Assembly, the International Criminal Court, and all the 192 UN member states which — based on his recommendations — were officially asked by the world body to open criminal prosecutions of Israeli leaders and officers. Goldstone must also write to the Swiss government to call off their effort, based on the Goldstone Report, to convene an international conference of the Geneva Convention signatories to condemn Israel. Goldstone will never be able to undo the poisonous anti-Israel libel that he spread around the globe, but as a judge we call on him to do the bare minimum that legal ethics and common sense require. While most of the mainstream media has covered the story, two of Goldstone’s biggest cheerleaders , The Guardian and The Independent have yet to report on the about-face. In particular, The Guardian’s over-reporting of Israel — as expressed by this map produced by British Views of the World (read more background and signficance) – behooves the paper to follow through. Goldstone’s commentary was published on Friday, and yet as we go to press, neither paper has picked up on the story. It is impossible to know exactly what prompted Goldstone to reverse his positions at this time. But one thing is certain: it couldn’t have happened without the many people who refused to accept the Goldstone Report’s false conclusions and continued to fight in the public arena. Everyone who spoke out against the report deserves a share in the credit for bringing the truth to the surface, however delayed. The fight, however, is far from over. The Goldstone Report has caused great damage since its publication nearly two years ago. It is now up to the media to promote the truth about the Gaza war with the same intensity it promoted the conclusions of the Goldstone Report. And it is up to all of us to hold the media to account to ensure the truth is revealed. A story is told of a man in Poland, when it was home to over three million Jews, who admitted that he had spoken slander and now regretted his action, and that he wished to repent. His rabbi told him to take a feather pillow, climb up to the roof on a windy day, and tear the pillow apart. After that he should go around the village and pick up each feather.